One front rotor and one rear rotor is mounted on the panel. Student can apply brake by pedal (or by hand lever, in case of hand brake). The rotor will stop rotating. The pressure at different points will be measured. A lamp will glow when the brake is applied. The system is complete with electrical wiring, switches, vacuum generating device (if required), etc. 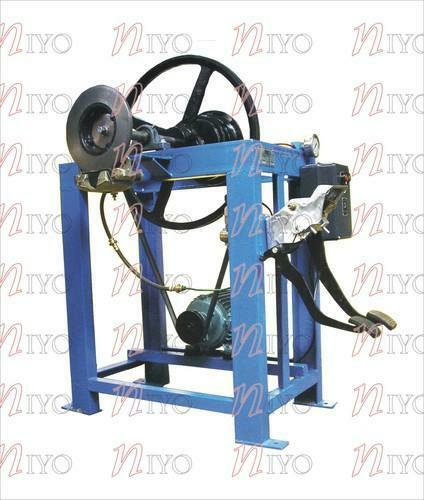 Various types of brake system are supplied, depending on the user requirement. Entire brake system is supplied. One front rotor and one rear rotor is mounted on the panel. The hub is rotated using electrical motor at relatively lower rpm. NiYo is a leading worldwide provider of quality products and services in the field of technical and vocational education. NiYo is focused on providing innovative educational training and laboratory equipment of the highest quality to educational institutions and industry training centers in India and abroad. NiYo has been designing and supplying quality engineering teaching equipment and has established a tradition of excellence in meeting customer requirements. We, at NiYo, pride ourselves on the quality of our products. The products you purchase from us can be trusted for accurate and repeatable results over many years of use. NiYo believes your training budget should be invested wisely, with confidence in the longevity of the equipment you secure for your facility.